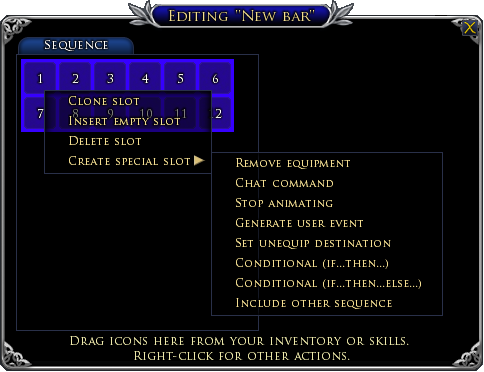 In addition to the usual icons (items, skills, hobbies, pets, aliases) that can appear in any Quickslot in the game, SequenceBars also allows you to create "special slots" that give extra functionality in a sequence. This slot causes an item to be unequipped (removed from the body and placed in the bag). This slot executes the desired chat command (for example, an emote). This slot stops the animation of the bar: Clicking slots will no longer scroll the bar (until the bar is reset). This slot generates a user event. You can configure user events to show, hide, or reset other bars and groups. This slot lets you specify where in your bags an item should be placed when it is unequipped. This pair of slots lets you specify a set of slots to be included in the sequence only if a certain condition is met. These slots let you specify a set of slots to be included in the sequence only if a certain condition is met. You can also specify an alternate set of slots to be included if the condition is not met. This slot can be used to build up a longer sequence by including the slots from other sequences.